Straight from our poetry notebooks these students really impressed me with their poetry writing! Go first graders!!! Yikes! Teaching First Graders to Be Poets! We began our poetry unit last week. I spent Sunday afternoon at the library with my hubby and two children. We checked out 31 poetry anthologies for my pumpkins to immerse themselves. My husband just shook his head as we stood in line with a mile high pile of books. We paid my fine, (I swear, they should dedicate a new wing with the monies I pay in fines!) and then we went off to read some excellent poetry. Monday morning arrived and I mentioned that I had put some new books in a basket and that each student needed a book to read from during Independent Reading time. We made our selections and began looking through our great poems. You know we couldn't keep those great morsels to ourselves so we spent a lot of time reading them to a partner. We worked all week on how to read poems, how to stop at the commas, and line breaks. We discussed what the author's purpose was during certain poems. We put some poetry in place in our classroom. We reflected on poems and who they reminded us of, always making connections. (How does one curriculum map all of this?) We even sent poems to our fourth grade friends and started a project at our school called, "Poetry in Place." Week one: poetry immersion. This week we discussed what we notice about poetry. My favorite from a very insightful young man, "Poems say things in very odd ways." How about this one, "the words and lines are simple, but you know what they're talking about." Tuesday, we made a list of where poetry may hide for us. I made a list from simple to more insightful, these things made the list. Wednesday, I chose something from the list and made a list of feelings, and actions. I wrote about my dog Louie. Students did an excellent job with this, I was very impressed! Today, I took my actions and feelings list and modeled my poem about Louie. -poem words must be chosen carefully because you can't use a lot of them. -poets like the sound of repetition, kind of like Keven Henkes! My goodness was I impressed, I will post some for you later, especially my favorite poem. There was a lot of listening today, something that is few and far between during these warm spring months. My kids did terrific. Where to go tomorrow? 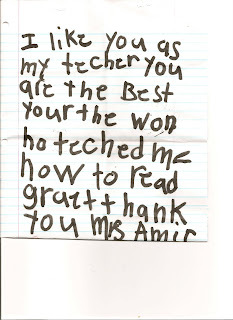 "I like you as my teacher you are the best your the one who taught me how to read great. Thank you Mrs. Amick!" I got this note the day after my birthday. It was among the many that I received. What I like most was that this one didn't just mention that I was the best teacher, it mentioned that learning to read "great" happened for this child. She is a great reader but I really felt my importance, I opened the world for this child because now, she is a reader. I always think that if they write about it they realize its importance! This is my passion, realizing that reading and being able to read is a gift! On Monday, the girls and I drove the two hours that it takes to get to Toledo to visit the Toledo Zoo. We go there because our zoo pass gets us in free and it is just a lovely zoo. We see a lot of the animals that the Fort Wayne Children's Zoo doesn't have in their exhibits. My favorite part, and don't laugh, are the buildings. The Toledo Zoo has a lot of indoor exhibits. In fact, when you go there on March 31st a lot of the animals are inside these buildings. It's pretty great though because you can see a lot more of them inside than when they are on display outdoors. Not so great for the animals I am sure but great for viewing. Some of the exhibits are always inside, for instance, the zoo has a wonderful reptilian exhibit and aquarium. These are my favorite buildings, for they were built out of brick and mortar. They are exceptional in their workmanship. A real architectural wonder right there at the zoo! Why? Most of the zoos buildings were built during the Great Depression! During "the Works" era Roosevelt decided to put men back to work, the federal government created jobs for them. The Toledo Zoo was one such project. On site you can view several buildings that were built for this project, and they are stunning. I always think though, what did those men think as they were building these buildings. Were they just thankful to have jobs? Were they thinking, "who will be able to afford coming to the zoo at this time?" I just wonder what were they thinking? As I tool around the zoo with my girls I always stop to read the signs. They are there to commemorate a time when people had great need. I wonder, do people stop to read them? Do they stop to think about the men, and their families, and their struggle? Sometimes, in the present, we think that we have struggles with the economy, and gas prices, etc. I am glad that this one bit of history, this architecture is there to help me be thankful for what I do have. Be thankful for what this country has become, and trust that it is still made up of men and women that can work through great struggles.